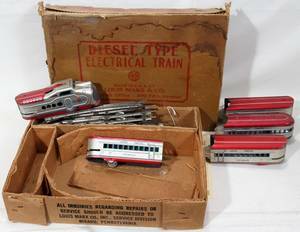 Marx (circa 1930s), prewar metal O gauge train with mustard yellow to brown, yellow and red lithograph decoration on tinplate exterior depicting the Union Pacific M-10000 United States Mail Railway Post Office, Coach, and Coach Buffet. Wind up train accompanied with key. Marx streamline O gauge Union Pacific eight-piece train set. 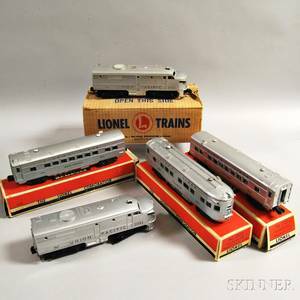 Group of Five Lionel Electric Train Cars In Boxes.